Cheers Jeff! ‘’Tis a lovely song...and it’s called “She Used to be Mine” written by Sarah Bareilles from the Broadway musical “Waitress”. Lucy’s voice is so calmingly magic to these ears. To my ears too Joe ! I hope Lucy makes an album but I've found from experience over the years that singers from talent shows make one album then get dropped by the label and some end up in pantomime at Ellesmere Port ! I left a comment (as eightstarmusic) on Lucy's 'She Used To Be Mine' YouTube video and she gave a nice reply. Lucy said she was going to record something a bit different last Thursday. Lucy also said she likes singing both musical theatre and pop ballads. So I cannot wait to listen to her latest song. Lucy Thomas will be a guest performer of Phil Collins at a charity concert at Miami Beach! Phil's charity, Little Dreams Foundation, provides professional and celebrity mentors to guide and educate needy children who show talent in sport, art and music. Details: LDF's 4th Annual Dreaming on the Beach Gala, November 15th, 2018 at the Fillmore, Miami Beach. I was pleased to learn that my Facebook friend Gary will assist in producing November's charity concert organised by Phil Collins. Lucy will be a guest performer at the Miami Beach concert, and Gary hopes to obtain Lucy's autograph for me, oh and maybe from Phil Collins too! Lucy Thomas will be heading to the USA in a few weeks to perform with Phil Collins in aid of his charity Little Dreams Foundation. Today, Lucy began to record her first album at British Grove Studios in Chiswick, West London. This is where Hayley recorded her "Hayley Sings Japanese Songs" ten years ago. Conducting the orchestra was composer James Shearman, who has a CV full of English film scores under his belt. 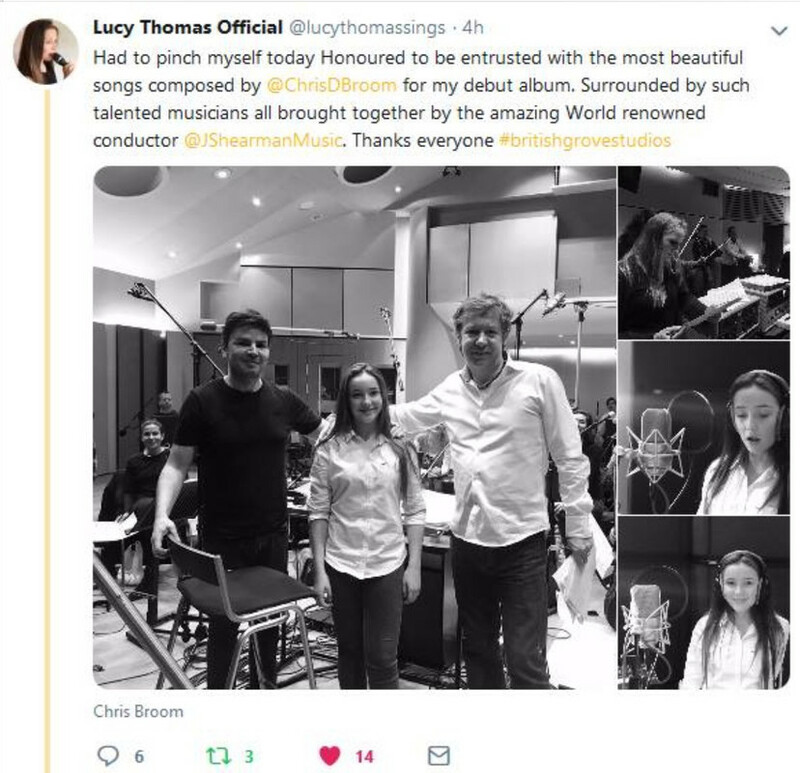 One of the songs recorded may have been 'One Day' by Chris D. Broom, the Brighton-born songwriter who works with Classical Reflection and Jonathan Antoine. 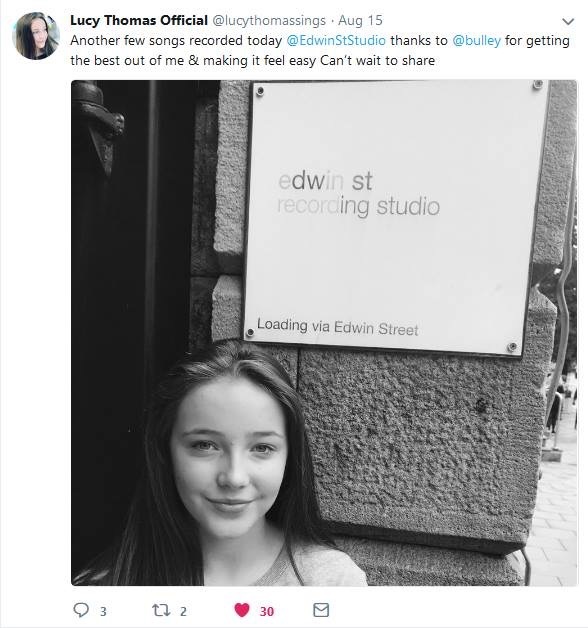 Lucy also recorded a duet with Will Callan who competed with her in The Voice Kids series two. I was very surprised to see that the first series of The Voice Kids UK is on American TV, on the cable channel Universal Kids. The episodes air on Saturdays at 4:30 pm eastern, and reair Wednesdays and Fridays. Courtney Hadwin was on the first episode. i hope the second series will air soon after...so Lucy can get better known th America! Lucy Thomas has had to cancel her appearance at Phil Collins’ charity concert in Miami next week. 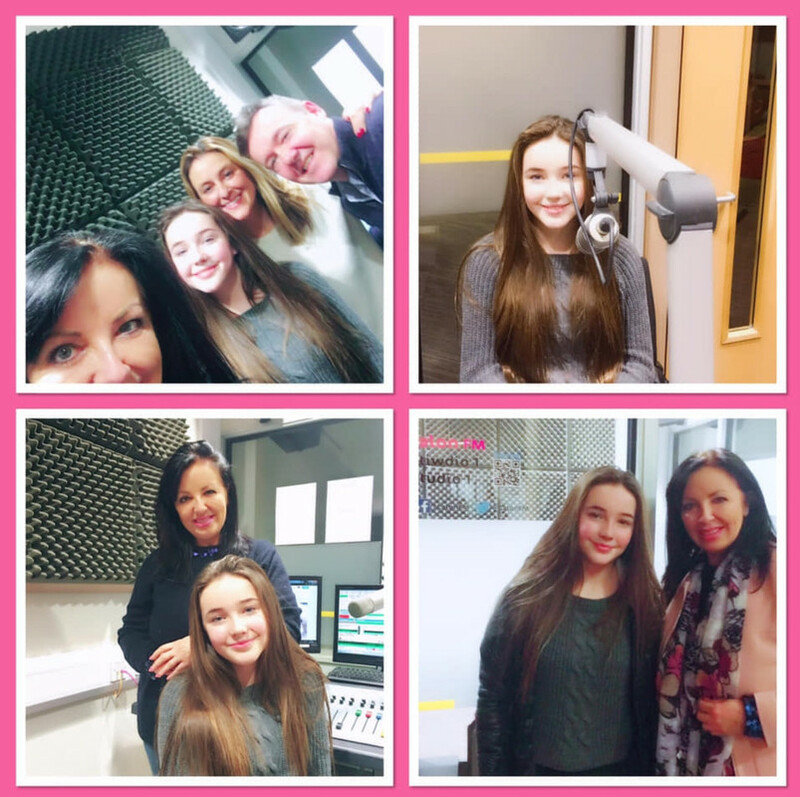 Unfortunately her mum Louise said that due to Lucy’s busy studio recording schedule and upcoming deadlines, they cannot make the trip. I had had hoped that my concert stagehand friend would get me Lucy’s autograph, but I still hope for Phil’s But Lucy might sign her CD for me. I did offer to help them financially with album costs etc. There are two ordering options...digital download or physical AUTOGRAPHED CD. It is an all-new website featuring a secure order checkout, photo gallery, SoundCloud music gallery and an About page. Cavendish Records is an independent record company showcasing classical crossover talent. I am unsure what role Chris Broom has in it. Their first two album releases under Cavendish have been top three and better in the Official UK Classical Chart...Jonathan Antoine’s album “Believe” hit #1 and Natalia Krishtopet’s album “Embrace” reached #3. Another stunning update from Lucy Thomas! A new video featuring clips of three songs... 1. 'Tightrope' from the musical The Greatest Showman, 2. 'Let It Go' from the movie Frozen, 3. 'Someone Like You' from the musical Jekyll and Hyde. Promotional video for Lucy Thomas's album release... in about three weeks! Lucy is introduced at about the 23:45 mark.